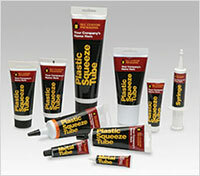 We can put the squeeze on your tube filling needs! We are proud to say we own and operate two Norden hot air tube filling & sealing machines. Norden is widely accepted as the world’s best tube filling & sealing machine manufacturer. The hot air sealing system is the strongest and most attractive way of sealing a tube. They are efficient and yield very little waste, thus allowing us to provide you with competitive pricing. Our two Norden machines can fill LDPE, HDPE, coextruded, and laminate tubes in sizes ranging from .25 to 10 fluid ounces. We work with many different tube manufacturers and have a limitless number of caps and head styles available to us. Below is a sampling of some of the available options.